Bonzo thrashes wildly at anything within reach during a frantic The Song Remains the Same. Page's fingers become entangled in the strings during the first guitar solo in Sick Again. The tape is cut between songs. The beginning of Jones's piano solo during No Quarter is met with a loud cheer from the crowd. Page shreds erratically through a somewhat choppy guitar solo. Unfortunately, The song is cut during the final verse. We return during the first verse of Ten Years Gone. Before The Battle of Evermore, Plant tells the crowd "it wasn't quite as hard as this five hundred years ago, wandering around with acoustic instruments... cause the oak tree probably didn't hold more than about two people" during a long pause while the band retunes. Going to California is introduced as "a song that reeks of California." White Summer features an eerily beautiful passage just before the Black Mountain Side section begins. The crowd erupts as Kashmir kicks in. Only the final two minutes of Achilles Last Stand survive on the tape. Plant dedicates Stairway to Heaven to the crowds the band played to on the 1975 North American tour "and the good times all along the way." The show-closing Rock and Roll is a cacophonous explosion of energy. The tape is muffled and noisy. 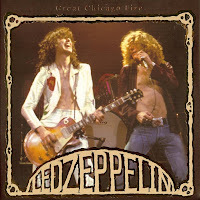 In 1977, Led Zeppelin played the Chicago Stadium: March 13,14, 16, 17. Page was sick Monday, the 14th. I was there, & checked my tix stub, Wednesday the 16th. I was at the 4/7/1977 show and have a full recording of it. Great night!